As lovely as the summer can be, there’s something deep down that I know I’m missing. That, my friends, is home. Today is Singapore’s National Day. It’s the day that I’ve celebrated annually as a kid singing patriotic songs and watching beautiful fireworks by the National stadium. It’s the day we wear red shirts and white bottoms; the same patriotic colours on our flag. My little red dot turns 47 this year! We are a young but wonderful nation with an endless list of success that is boast-worthy. So, to commemorate this day from far far away, I decided to dedicate this traditional cake well-loved and known by the locals. In Singapore, you can easily find it in many bakeries. Amongst them, Bengawan Solo is probably one of the more famous ones. 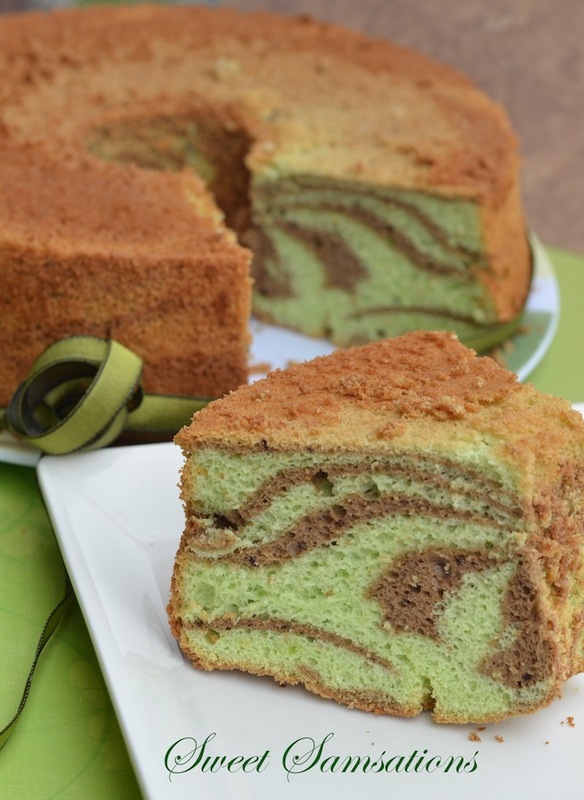 Have you ever had Pandan flavoured cakes before? Pandan is a fragrant leaf mostly grown in tropical areas of Southeast Asia. 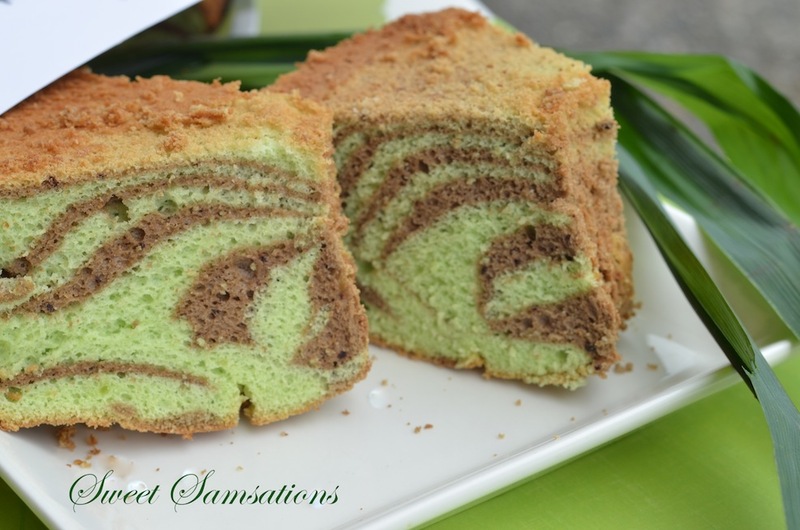 This is a Pandan Chiffon Cake. However, to add a little fusion, I incorporated the zebra technique which I have been dying to experiment with ever since I saw it on The Diary of a Mad Hausfrau. She definitely has the most creative ideas! 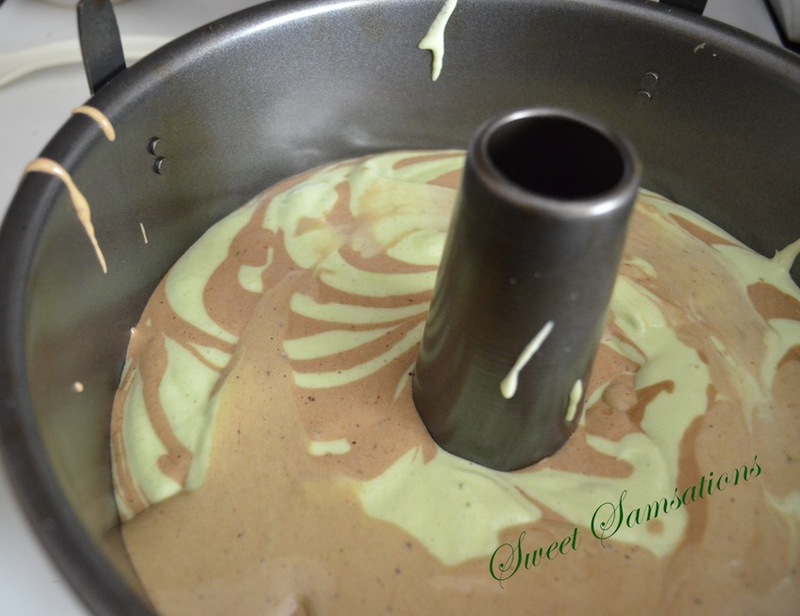 I adapted this Pandan Chiffon recipe from Angel’s lovely blog with some adjustments and changes. Please refer to her blog for the original recipe, also you get to listen to my favourite Bossa Nova artist!! Beat egg yolks and sugar in until pale in colour and sugar has been completely dissolved. Mix in pandan juice, paste, vegetable oil, and salt. Sift in cake flour and baking powder, fold until combined. Using an electric mixer, beat egg whites till frothy, adding a third of the sugar and all of the cream of tartar in. Continue to beat and gradually add the remaining sugar, beating until stiff peaks form. Divide the batter into half and mix in cocoa powder with one half. Bake in preheated oven at 175C for about 40 mins. Invert the cake immediately once taken out from the oven. Cool completely before removing from mould. Can you not love Vancouver? 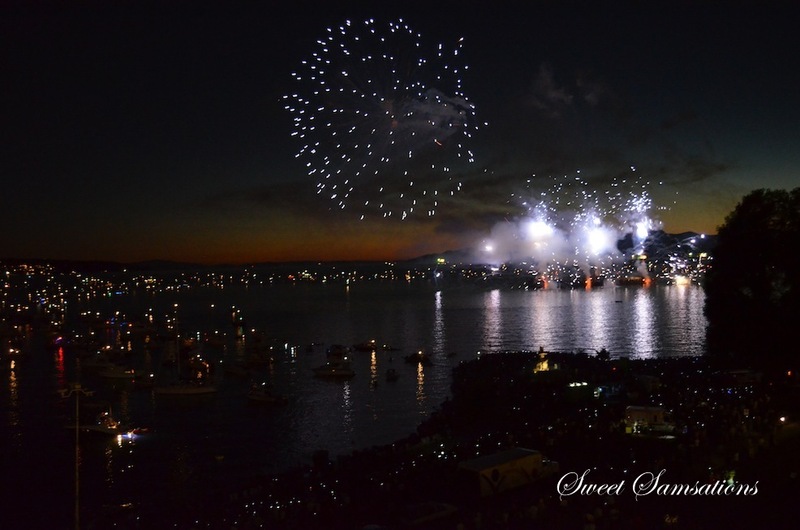 These annual Fireworks competition by English Bay is one of the things Vancouverites look forward to in the summer! Of course, beating the crowd and feeling claustrophobic during the transit home isn’t. 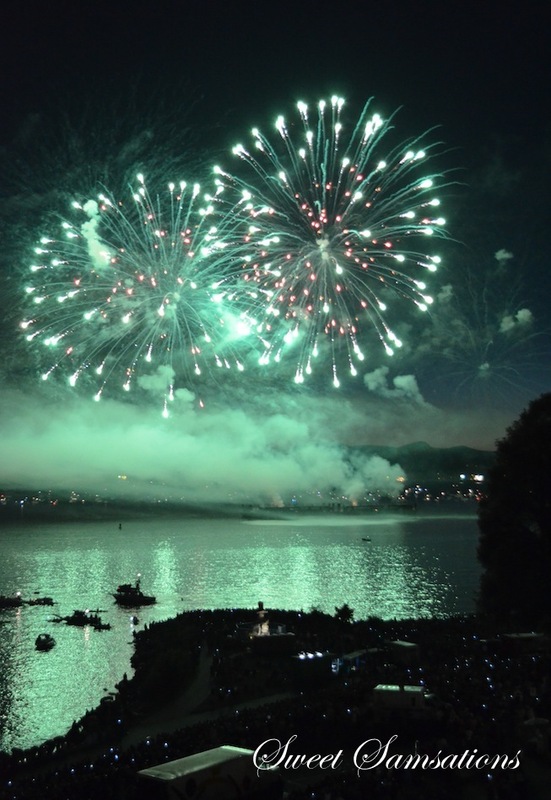 Honestly, I wouldn’t have gone to watch the fireworks had my friend not invited us to his place! You make the best cakes, and this one is no exception!! Yeah, pandan is a flavour I grew up with! Looove the smell of it! Such a beautiful cake! It looks delicious! 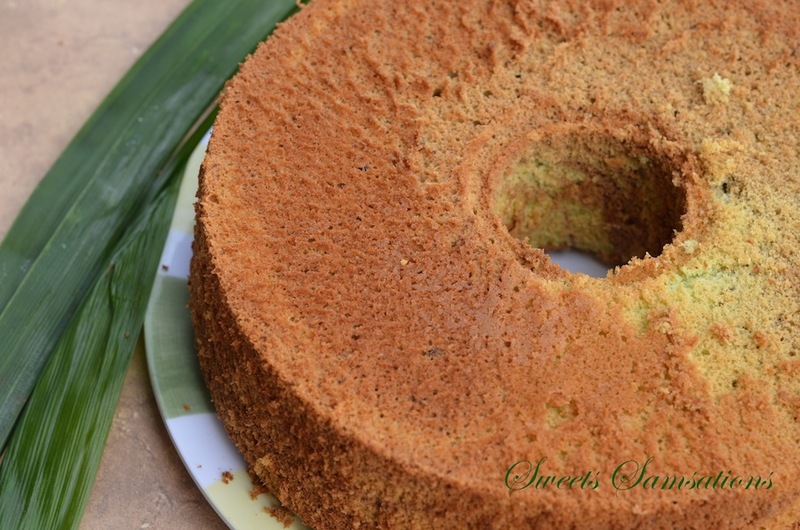 I love this cake and I have Avery special place in my heart for Pandan leaves. I was giving a few of these gorgeous leaves in Malaysia once, to scent my handbag and luggage and that sweet smell stayed with us for days. I love the colour of your chiffon cake with the marbling and especially love that firework piccy with the Pandan green light too. Happy bday to Singapore indeed, the world would not be the same without Nonya style chilli crab! omigosh!! I miss chilli crab soo bad!! Wish I could have some! haha! Pandan does give a very nice aroma! I haven’t heard of putting it in bags and luggages but that definitely sounds like a great idea! Thank you Alice! 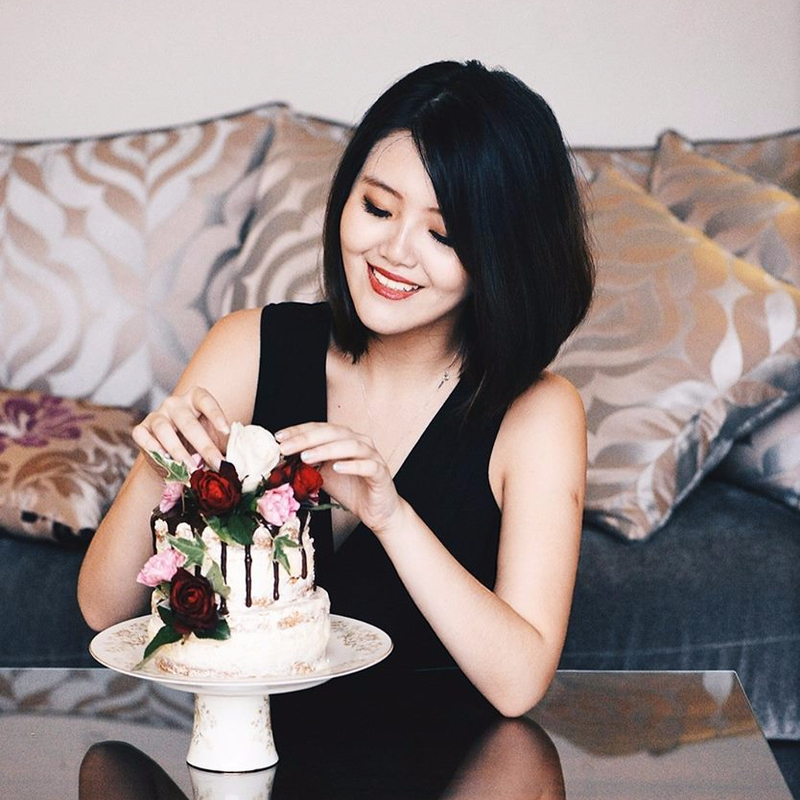 Happy birthday to your beautiful Singapore, Sam! What a lovely cake. I love Vancouver too, it’s proximity to the mountains and Ocean. We are indeed lucky to have such a place (however wet and chilly) as part of Canada! I won’t complain about out hot summer any more. Sorry. I love this! Another beautiful Cake!!! What a pretty and tasty looking cake! Happy national day, Sam! Hope you managed to catch the parade via webcast.. It was perfect weather for the celebration. Oh, and your pandan cake looks yummy! Thanks Jo!! Noo.. Didn’t manage to catch the parade. I’m sure it must have been wonderful though!! This is absolutely gorgeous Sammie! I love the pandan cake color – always fascinated by it but never tried pandan leaves in my life. 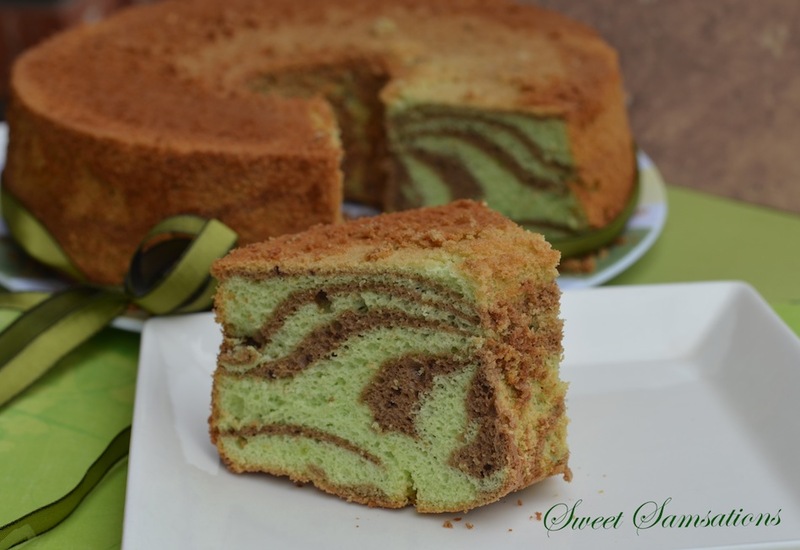 I love chiffon cake and your chocolate swirl looks beautifully done! Thanks Nami!!! I hope you get to try pandan some day! They make my absolute favourite desserts!! yumm! Happy 47th birthday Singapore. Not familiar with pandan so must Google to learn more. Beautiful cake. I had no idea that Singapore was so young! You’ve made a gorgeous cake to celebrate. haha.. Thank you Kiran!! I was kinda going against tradition by including the chocolate but I really wanted to try a zebra patterned cake! Glad it turned out well! Beautiful cake Sammie, love the “zebra”, and the cake looks so light ans soft. What a delicious way to celebrate! A delicious and very pretty cake. 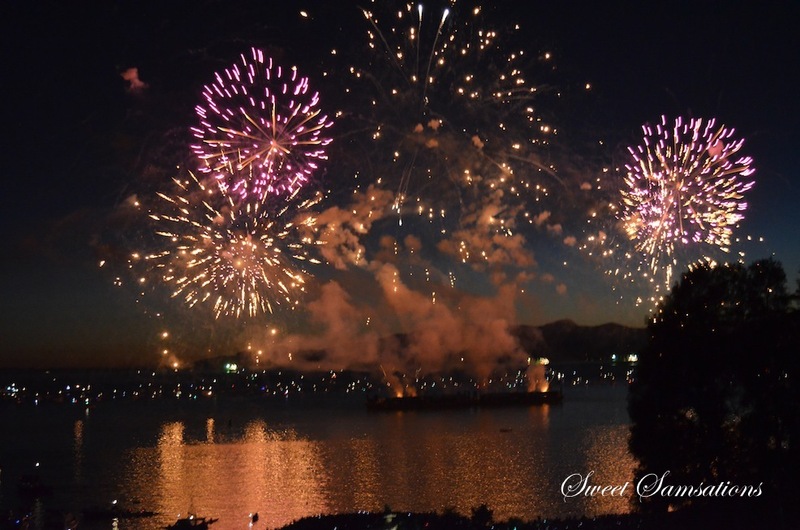 The fireworks are fantastic, amazing shots! That’s awesome!! I hope you try it!! What a gorgeous cake for a wonderful celebration. the stripes are perfect and I love the green color. I have a bottle of pandan essence back in Germany I need to use at some point. Thanks for the shout out and the link love! Thanks Amy!! I’m glad you like it! awww!!! It wasn’t too bad. Though I would have to say it also wasn’t particularly extra-spectacular! So don’t worry my dear! You aren’t missing out on too much! Gorgeous looking with those swirls of color. I love the sweet-earthy taste of pandan. Truly unique. Thanks Liz!! You should be able to find them in Asian grocery stores. Especially the Southeast Asian ones like Vietnamese ones! haha..
I’ve tried the recipe. Nice cake ands thanks for the recipe…due to my coconut milk was stale, I forgot to put in the fridge. So I replace with fresh milk…:) the taste not as good without using coconut milk but still very nice. I like it. Thanks again Sammie. That is gorgeous! And I’ve never even heard of pandan before…sounds interesting!